Abstract: Nonlinear frequency conversion is often challenging when light with extremely long or short wavelengths needs to be generated. This article discusses the many reasons for that. Nonlinear frequency conversion – for example, frequency doubling or optical parametric amplification, can be performed in very different spectral regions. 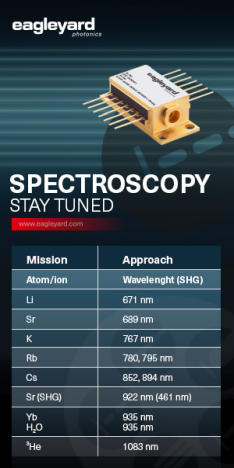 In this article, I discuss some challenges which one encounters in extreme spectral regions. Some of them are related to limitations of nonlinear crystal materials, but there also some others. First, we obviously need to have a nonlinear crystal material with sufficient transparency. There is a limited range of materials with good transparency in the ultraviolet region – typically, one uses borates such as BBO or LBO. As far as those offer suitable phase-matching schemes for the wanted nonlinear interaction, this is fine, but the limited choice of materials can of course make it difficult to obtain phase matching in a convenient way. For example, in some cases one would really prefer to have type-I phase matching, but can only get a configuration with type-II phase matching. Note also that quasi-phase matching is difficult to realize for ultraviolet light generation, because (a) the typically used materials (e.g. borates) are not suitable for techniques like periodic poling and (b) the required poling period would anyway be inconveniently small due to the strong chromatic dispersion for short wavelengths. If you obtain phase matching in some way, you will usually find that the phase-matching bandwidth is fairly small due to the strong chromatic dispersion, i.e., a strong wavelength dependence of the refractive index at short wavelengths. This is a problem mostly for converting ultrashort pulses: the resulting group velocity mismatch can easily become several picoseconds in a few millimeters. Efficient conversion without temporally broadening the generated pulses usually requires that the overall group velocity mismatch within the crystal length stays below the pulse duration. So you have to work with a quite limited crystal length, making efficient conversion more difficult. You may look out for crystal materials with low group velocity mismatch, but those tend to be the ones having a relatively low nonlinearity. A further difficulty is that the damage thresholds of optical materials are relatively low for ultraviolet light. This is essentially because a relatively small number of photons is sufficient to push an electron from the conduction band into the valance band. In many cases, two photons are already sufficient – one then has substantial two-photon absorption, which is not only inconvenient in terms of losing light but also because the generated free carriers cause additional trouble. Typically, they are involved in damage and degradation phenomena. Certain impurities can also contributors such effects. Through various mechanisms of that kind, one often suffers problems like rapid degradation of crystals. For ultrashort pulses, the combination of strong group velocity mismatch with limited optical intensities (for avoiding optical damage) is particularly bad; it often severely limits the possible single-pass conversion efficiency. In that regime, frequency conversion works better with longer pulses; one can then use longer crystals. The stronger effect of beam divergence in a longer crystal may not be a problem, if the focusing is anyway limited by damage phenomena rather than by beam divergence. Light with rather long wavelengths can be generated by difference frequency generation, as idler light in parametric amplification or oscillation, or with optical rectification. Another problem results from the strong beam divergence for focused light at long wavelengths. This can be a particularly severe problem for the generation of terahertz radiation; even if the input light can be tightly focused, that may not help very much if the generated terahertz wave diverges so strongly that it quickly loses overlap with the pump light. Note also that for THz radiation the frequency bandwidth is often not much smaller than the mean frequency. That implies that the strength of divergence varies substantially within the pulse spectrum. That leads to complicated spatio-temporal properties of the generated light, which can make it difficult to efficiently get the light to some application. Another challenge is that the involved low frequencies make it difficult to effectively radiate light. Consider, for example, difference frequency generation with two optical input beams. These generate a nonlinear polarization wave in the crystal, which then must radiate the wanted light. Even for low generated frequencies, the generated nonlinear polarization can be quite strong. However, the radiated power is not only proportional to the square of the amplitude of the polarization, but also to the fourth power of the generated optical frequency – this is the same dependence as for radiation of a simple oscillating dipole. So even if you push the material as hard as it can tolerate, you won't get much power out at a low frequency. Besides, the resulting power conversion efficiency is fundamentally limited by the photon energy issue: one higher-frequency photon is converted into one output photon and an additional photon for the lower-frequency input wave. So the power is primarily converted from one optical wave to the other, rather than into the wanted product wave.